If you keep a close eye on our portal, or happened to come across the article one way or another, you’ll know that Gingerbread 2.3.4 has surfaced. It’s always exciting to receive an update. It makes things feel fresh, up to date and most importantly of all, functional. But that’s not the only thing which has surfaced from Google in the last few days. Along with the new update comes Google Talk 1.3, Google’s updated Gmail IM to support video calling. However, if you’re not so hot on the idea of downloading an update and flashing it just to get Google Talk, XDA member britoso has been very delightful and extracted the program from the update for use on any device running 2.3 and over. The apk, which is provided, cannot be installed directly to your phone by a simple download, though. To install the app, you must uninstall the original Talk app and push the new one with adb. If you’re familiar with this process, though, you’ll have no troubles, I’m sure! 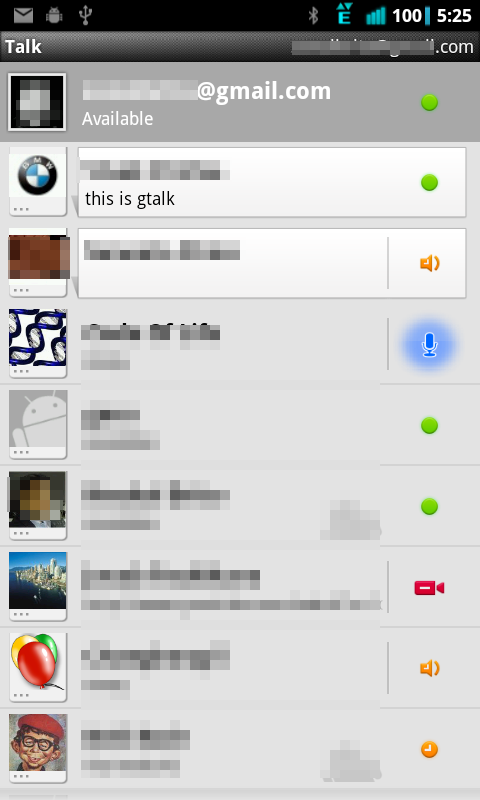 This is the new Google talk from the Nexus S update yesterday. Deodexed, made a one line comment in the smali, recompiled, pushed…works!!! The general response is that the extracted app works, but there does appear to be the occasional issue when it comes to the phone detecting the camera to use for calls. Disregarding that, if this is something you’d like to try, head on over the to the original thread and install the apk.